A fight over money at a Walmart in Lebanon, New Hampshire led to the arrest of three people in the frozen food section of the store. The altercation reportedly started when Calvin Molina, 25, came to the store to confront Juan Marin, 27, about some money he owed him, according to a statement from Lebanon police. Things eventually escalated into a fight between the two men. By the time Lebanon officers arrived on the scene, Molina had a head laceration and Marin was being restrained by an off-duty Hartford police officer and other bystanders. 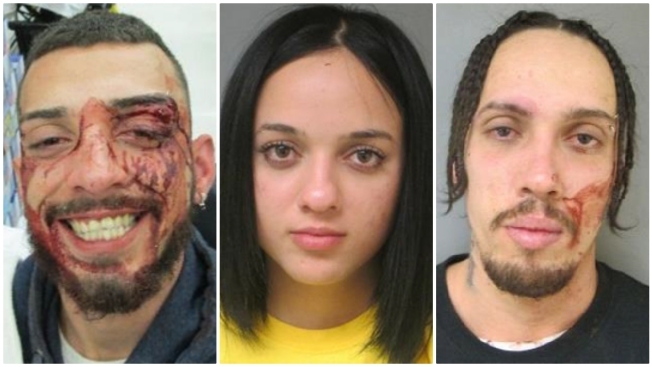 Molina was transported to Dartmouth Hitchcock Medical Center for treatment - but not before he snapped a smiling selfie of his bloodied face and what appears to be a slashed brow. Marin was charged with two counts of simple assault, Molina with one charge of simple assault and resisting arrest. Both are due in Lebanon District Court in May. A third person, Yamaris Marin, 20, was charged with two counts of simple assault. She is accused of assaulting the off-duty officer who attempted to break up the fight and then interfering with Lebanon officers attempting to take Molina into custody. Her arraignment will happen in Grafton County because she received an enhanced misdemeanor for allegedly assaulting a police officer.